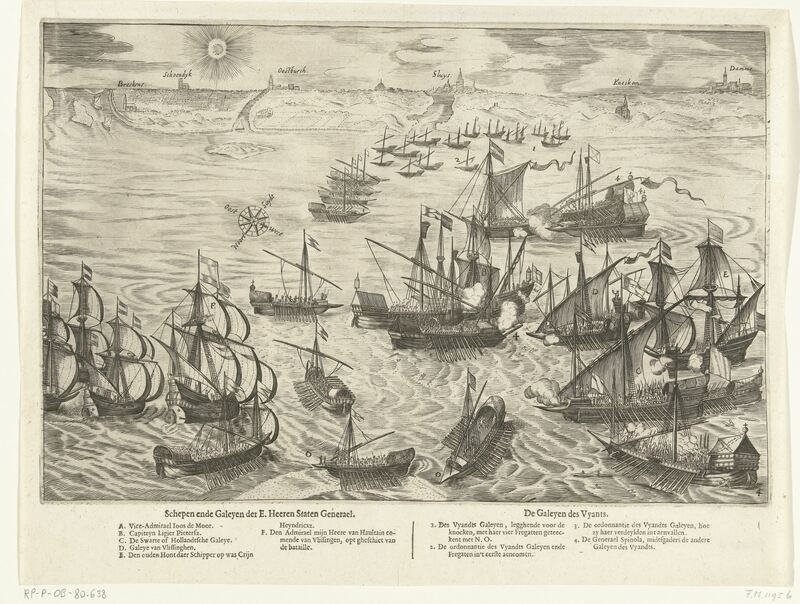 Part of the fleet commanded by Federico Spinola which was beaten by the Dutch fleet off Sluis, Flanders, Dutch republic on 26 May 1603. (1) Commanding officer Bartolomé Ripoll. 1. Don Ambrogio Spinola. 1st Marquis of the Balbass (1568 Genoa, Republic of Genoa-25 September 1630 Castelnuvo Scrivia). His brother Fderico (1571 Genoa, Republic of Genoa-26 May 1603 Sluis, Flanders, Dutch Republic) commanded the galley fleet which was beaten by British and Dutch warships in June and October 1602 and died in a sea battle off Sluis. C. Fernandez Duro. Historia de la Armada Espanola, vol. III.